The Squires Squad: My Family Reunion and Harry Potter!! My Family Reunion and Harry Potter!! Neither has to do with the other but I thought I would just mention the fact that I really loved the new Harry Potter movie. We saw it with KSL on the afternoon before it came out. I thought it was way funny and had some action and of course sadness. My niece Sierra came with us and of course we both cried at the end. What more can I say we are both cry babies. Now for the reunion. This past weekend was our biannual Smithen Family Reunion. 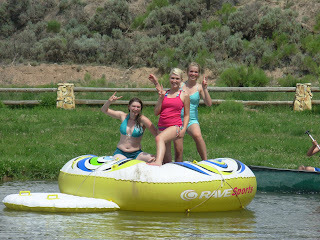 We had it at this place called the Rockin R Ranch in Antimony Utah. It was great fun. My sis Wendy was in charge and did a stellar job at organzing it. There was horse back riding, tubing, hiking, four wheeling, archery, and swimming. But the best part was the family rodeo. 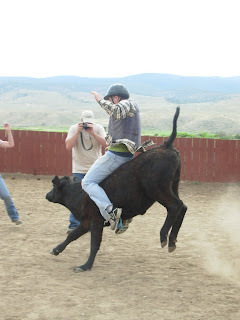 Barry did the barrel racing and if it hadn't been for his shoulder surgery, he would have done the calf riding. I just did the relay race and had to throw cow poop! Gross. Here are some pictures from the enjoyable event. Andrew riding a horse with her baby attempting to eat. Tiffany, Sierra, and Tayler enjoying a swim. 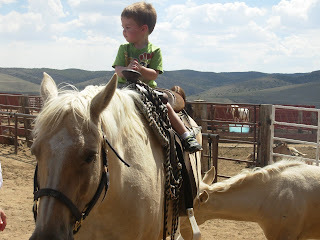 This is my favorite picture of my nephew Padan riding the calf! !